Across the borough, around 6,500 premises have been upgraded by engineers from Openreach, the business responsible for Britain’s largest phone and broadband network, since the launch of the first North Tyneside fibre broadband cabinet in Northumberland Square, North Shields, just over a year ago. Most recently, additional properties in Killingworth and Battle Hill have joined those upgraded earlier in the roll-out in communities, such as Wallsend, Shiremoor, Annitsford and North Shields. A further 960 will be upgraded under current roll-out plans. 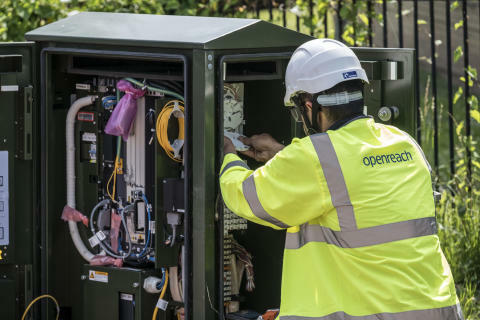 This is in addition to more than 75,000 premises already upgraded as part of Openreach’s own commercial roll-out of fibre in the borough. Hundreds of residents and businesses have ordered the new technology and are reaping the benefits of increased broadband speeds of to up to 80 Mbps1 - but that still leaves many people who have access to faster speeds but haven't yet upgraded. Welcoming the rapid progress, Elected Mayor Norma Redfearn, said: “I’m delighted to see that so many have taken advantage of the superfast broadband roll-out in North Tyneside. “We want everyone in the borough to be able to access the best services available and the roll-out of high-speed broadband will open up a number of opportunities for residents, as well as allowing local businesses to grow and regenerate the local economy. One business benefitting from the boost in broadband speeds is North Shields-based Wubbleyou, which builds web applications and phone apps to make businesses more efficient. Mark Renney, director at Wubbleyou, said: “Before our upgrade to superfast broadband we were seriously considering relocating the business as it was becoming increasingly difficult to work efficiently with the speeds we were getting. Transferring large files is a big part of what we do and staff were sometimes having to go home to send files to clients, which was far from ideal. “Since upgrading to fibre-based broadband our download speeds are 25 times faster enabling the whole team to work online simultaneously and without any restrictions. We can now transfer very large files, have team Skype calls without buffering and share screens so that we can work in collaboration and more effectively. Derek Richardson, Openreach programme director for the North East, added: “Although North Tyneside is an urban area, work to boost speeds across the borough has been vital. The demand for faster, more reliable broadband speeds, driven by the ever increasing use of bandwidth-hungry devices, such as smartphones, tablets and even TVs, has never been greater. And that need for speed will only increase so ensuring North Tyneside communities can keep up is essential. In total, £34 million has been invested in Digital Durham by Durham County Council, BT Group, the Government’s Broadband Delivery UK (BDUK) programme and public sector partners in North Tyneside, Gateshead, Sunderland, South Tyneside and Tees Valley.